The credit crunch which was discussed in depth in an earlier article - Hedge Fund Subprime Credit Crunch to Impact Interest Rates (31st July 07), signaled that regardless of the present fundamentals, interest rates were heading much lower and would ultimately be bullish for asset prices. The first central bank to act was expected to be the US Fed, followed by the BoE and then the European ECB. The credit crunch earlier this week nearly claimed its first major victim in the UK, Northern Rock Bank. Fortunately the Government took control of the situation and forced the Bank of England to rescue the mortgage bank Northern Rock Savings 100% UK Government Guarantee (17th Sept 07). Had the government not acted there was a serious risk of the contagion spreading to other banks. The risk of a meltdown in the British banking system have now been greatly diminished by this guarantee offered to savers. However the credit crunch is not expected to disappear anytime soon, and the impact of the freeze in liquidity is itself similar to a rise in interest rates to 6.75% and therefore to sharply impact upon consumer spending and economic activity in the UK over the coming months. The preferred measure of inflation in the UK by the government is the CPI, which today has now to below the BoE's target of 2%. However the RPI is an important measure for the UK economy as it is recognized as a more accurate measure of inflation and used in pay deals and in indexation pricing. The current rate of 4.1% is a contributory factor to higher LIBOR interest rate expectations. 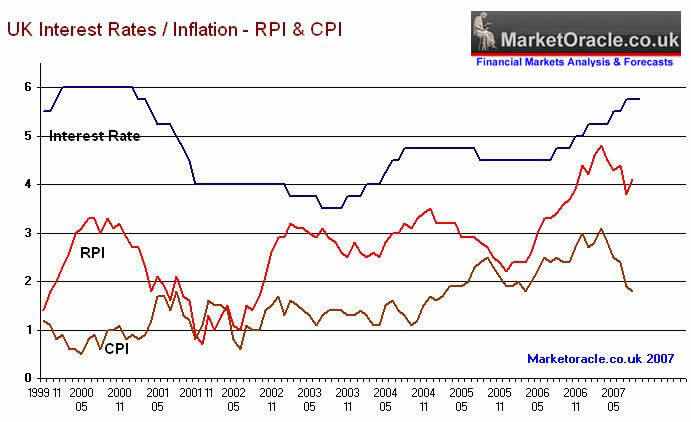 The trend in inflation, (both RPI and CPI) is clearly lower. The primary triggers for UK interest rate cuts are for CPI to fall below 2% and RPI to fall below 3%. CPI is currently below 2%, but RPI is some way from reaching the 3% triggering level. Therefore a cut in UK interest rates is not expected to occur until early next year, by which time RPI should have declined towards or below 3%. 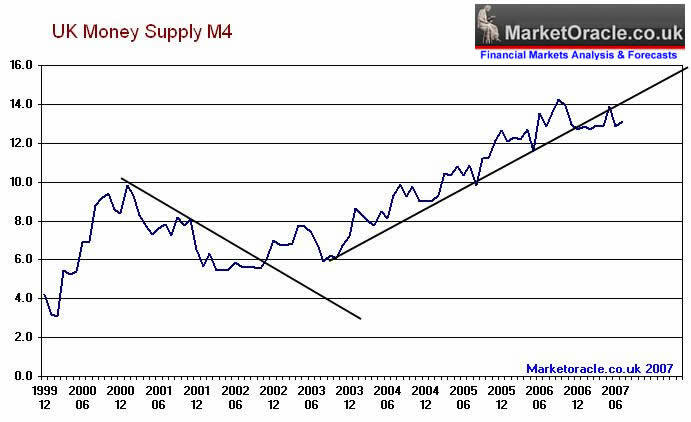 The warnings of an imminent peak in the UK housing market was issued on 1st of May 07 - UK Housing Market Heading for a Property Crash. Which was timed to occur with the introduction of the Home Information Packs (Hips) the impact of which was expected to drastically reduce the number of transactions. 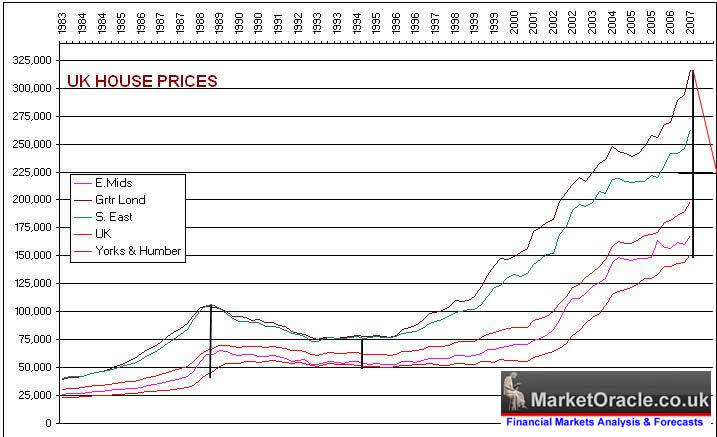 The introduction of the Hips was subsequently delayed from the scheduled date of June 07 to August 07, and have now started impacting on the UK housing market,UK House Price Fall Signals Start of Housing Market Crash (13th Sept 07). The Expectations as of 22nd August 07 (UK Housing Market Crash of 2007 - 2008 and Steps to Protect Your Wealth) are for UK House prices to fall by at least 15% over the next 2 years. This will have a significant deflationary effect on the UK economy and clear the way for UK interest rate cuts next year. The US today cut interest rates by 0.5% to 4.75%. The move is in recognition of the fact that the US may already be in recession, and this the Fed is attempting to cushion the depth of the recession much as occurred in 2001-2002. It is also in recognition that inflationary pressures are expected to ease in the US and across the world as the world economy slows on the back of earlier rate rises. The European Central bank is expected to follow a cut in UK interest rates early next year. Especially as the US dollar continues to trend lower against the Euro, thus lessening inflationary pressures within the euro-zone. UK money supply growth remains stubbornly high,though expectations are for a decline over the next 12 months to below 10% as trend analysis suggests that the rate of growth has now peaked. The former Fed Chairman, Alan Greenspan earlier this week commented on the expectations of UK interest rates rising to double digits. Which is contrary to this forecast. However he did confer with the forecast that UK house prices will fall over the coming two years..
As inflation moderates over the coming months, there will be gradual shift in sentiment towards lower interest rates towards the target of 5% by September 2008. However, the first rate cut is not expected until early next year. This is inline and in confirmation of the UK interest rate forecast as of 22nd August 07. Currently UK Savers are in a rare position, in that money market savings rates are at ten year highs despite no movement in the UK base interest rate. How long this state can continue is unknown, but it lends savers to the opportunities of locking in interest rates as high as 7% for a year or more, with the added safety of knowing that the savings are now 100% secure. as the Bank of England will come to the rescue of any major bank that may fall victim to the credit crunch. Once market sentiment starts shifting towards much lower UK interest rate expectations as against expectations of much higher interest rates, then these high Fixed Rate deals will disappear overnight. It is inconceivable that rates of 7% will be available once it is clear that the UK housing bubble has burst as will become evident as each months statistics are published. 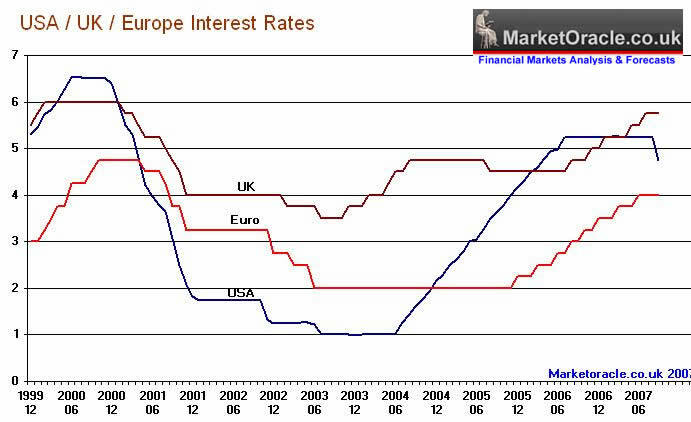 UK Interest rates are forecast to fall to 5% by September 2008. Savers should take advantage of current high fixed savings rates. Investors should prepare for timing stock market investments. The expectation is that today's Fed interest rate cut may already have sparked such a change in UK stock market sentiment on Wednesday's open (19th Sept). However, the credit crunch will undoubtedly have further negative impacts on the stock market during the next few months and thus offer further opportunities to buy selectively 'cheap' stocks for the long-run.